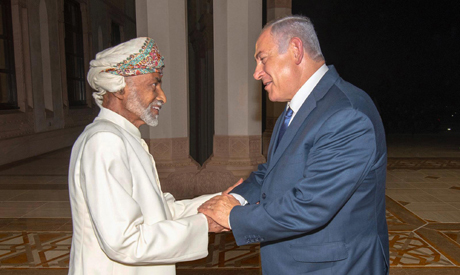 There are mixed signals about Israeli Prime Minister Binyamin Netanyahu’s visit to Oman where he met with Sultan Qaboos bin Said at the end of last week, especially in terms of the priority of issues and timing. Israel has also made public appearances at three Gulf locations but it is not clear whether this was coordinated or coincidence. Two Israeli athletic teams were in Qatar and one in the UAE, and reactions to their participation were processed differently than in the past in Arab circles. Questions were raised about what Gulf countries will gain in return for appearing to normalise relations with Israel, especially since countries that actually signed peace treaties with Israel, such as Egypt and Jordan, do not conduct themselves in this way. In fact, both countries have taken a stern tone with Israel. In Cairo, at the 29th Cultural Seminar hosted by the Armed Forces marking the 6 October anniversary, President Abdel-Fattah Al-Sisi said: “The Egyptian army was victorious, defeating Israel and causing it serious losses; we can do it again.” In Jordan, King Abdullah II decided to end Annex A and B of the Wadi Araba Peace Treaty that leased the territories of Al-Naqura and Al-Ghamr to Israel. After recent Israeli appearances in the Gulf, can the cold peace with Israel become a warm peace with Gulf countries? At the 14th round of the IISS Manama Dialogue in Bahrain, Oman’s Foreign Minister Youssef bin Alawi said his country is not mediating between the Palestinians and Israel, but is providing ideas to help both sides to draw closer. Bin Alawi stated that Oman’s main role in Palestinian-Israeli peace depends on what the US administration will do within the parameters of US President Donald Trump’s so-called “deal of the century”. “It is now time to seriously think about ending the problems that are holding back countries in the region from making the progress they deserve,” he said, adding that the Palestinian cause is at the heart of all problems that unfolded in the second half of the 20th century. He further noted that the creation of an independent Palestinian state is a strategic requirement, without which there will never be stability in the Middle East. Bahrain’s Foreign Minister Khaled bin Ahmed Al-Khalifa said his country “supports Oman’s efforts to bolster peace between Palestinians and Israelis”. Such statements imply that the Palestinian cause was the priority during talks in Muscat, which raises two issues. First, will Oman utilise the visit as part of the Arab stance which Saudi Foreign Minister Adel Al-Jubair also referred to in Manama, namely that normalising relations with Israel is contingent on agreeing to the Arab peace initiative which Riyadh presented to the Beirut summit in 2002. Second, Trump’s so-called “deal of the century” proposal. Said Okasha, an expert on Israeli affairs, linked the two issues. He told Al-Ahram Weekly that there are two interpretations that Israel could have based its reading of the situation. First, that Oman could put pressure on Iran through bilateral relations, especially since it was a mediator in the P5+1 agreement. “But I believe this is unlikely because it would have required the visit to be secret. Due to the public nature of the visit, we should accept what was publicly declared, namely that the Palestinian-Israeli issue was the agenda,” said Okasha. Oman may ask for amending the Gulf initiative in compliance with the deal of the century with European and US support. “Israel prefers bilateral deals, not multilateral ones,” asserted Okasha. During a meeting of the Central Council in Ramallah, Palestinian President Mahmoud Abbas commented on Netanyahu’s visit to Oman: “Even though the Balfour Declaration passed one century ago, there will never be a deal of the century.” But Okasha argues that Abbas may not be able to stand his ground in today’s climate, and pressure will be put on him to accept an unfair deal. Mohamed Abbas Nagi, an expert on Iranian affairs, agrees that Iran was not a priority during talks in Muscat, especially since Israel understands the sensitivity of the relationship between Iran and Oman. Nagi noted that Tehran’s reaction to the visit was not too critical either — just the usual criticism and accusations against Israel, which means the two issues were separate and Iran was not discussed in depth. There are similar precedents, especially when Syria was negotiating with Israel 10 years ago; also when Russia mediated between them recently regarding security arrangements in southern Syria. In Abu Dhabi, while everyone was focused on the Oman visit, Israel’s national anthem was played for the first time when Israeli judo player Sagi Muki won a gold medal at a judo championship. The event was attended by Israeli Minister of Culture and Sports Miri Regev, which was also an unprecedented official presence. Abdullah criticised the Muscat visit. “If the intention of the visit was to draw closer as a strategic necessity to confront Iran, then I don’t think much was achieved. Tarek Fahmi, professor of political science and Israel expert, believes that “recent manifestations indicate a new political perspective is taking shape on the US’s deal of the century.